Plasma Screen Cases, this is a new product this case can be made in any size to fit your screen. This version allows you to store and transport the screen in a vertical position. There is another vertical slot in the case which allows you to store cables, laptops, stands or dvd player. 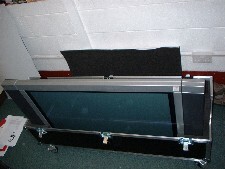 We also do a another version where you can lay the screen down in a coffin type case. Let us know your requirements and we can sort you out a price.